The following is written by Trey Magnum, HootSuite Campus Ambassador and undergraduate public relations student at The University of North Carolina at Chapel Hill. Trey has a huge interest in managing online communities and social media, specifically entertainment. Go Tar Heels! Want to see social media at its finest? Look no further than the championship season. Whether it be NHL, NBA, NCAA, or any other athletic event of your choice – there is a breakout team and star. Athletic organizations and athletes are becoming more involved with building and engaging their communities. Just last year HootSuite sent Marcus Jung to share his social media insight at the NCAA International Convention where education professionals listened and discussed how to implement strategic communication on campuses. 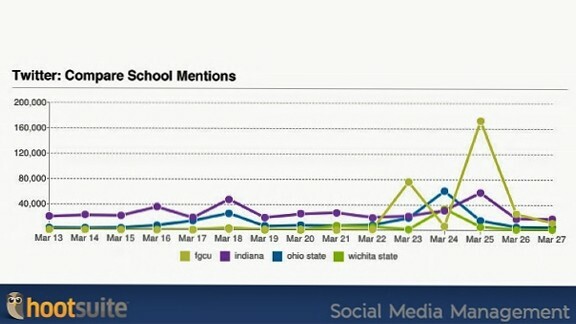 The 2013 NCAA Tournament is a prime example of how social media is being integrated into sports. Take the emergence of Florida Gulf Coast University as this year’s cinderella story and the injury of Louisville’s Kevin Ware go viral. 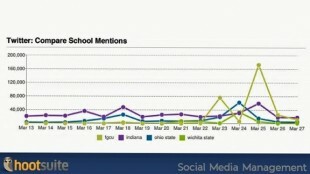 Everyone was tweeting about the #NCAATourney. I was sitting in my car at the drive-thru at Bojangles, yet I could track the score on HootSuite to see if the University of North Carolina (Yes, Go Heels!) was winning. At the same time I could switch streams to see the score in the VCU vs. Michigan game and be completely up-to-date in the world of #MarchMadness, all before receiving my four piece combo. More than likely those following along don’t want to know the exact moves of the players in the game. What they want to know is your commentary about the game. For example, instead of saying who has the ball right now, tweet about the coach who is about to catch a technical foul. HootTip: Add a stream in your dashboard just for the game! Click “Add Stream” and whether it is the official trending hashtag for the game or just what people are saying about their favorite player, you’ll be in the know! Don’t let all of your tweets fall only within the start and finish of the shot clock. Get involved in conversation before and after the game too! You may figure out who is the favorable opponent prior to the game as well as information about on what the teams are working on after. No one wants to hear ramblings about the game. You have to go hard or go home. If you’re a Kobe fan, know how about how many points he averages per game. Be able to tell if your favorite players and teams are on their A-game or not and see what others are saying. Tweet me at @the_trizzy for any questions, comments, or follow-ups. If not, I’d love a follow!